(2012.201.B1034.0227, Oklahoma Publishing Company Photography Collection, OHS). The threat of a war in Europe in late 1938 and 1939 stimulated the United States government to begin a national defense program. As a result, several new ordnance plants were constructed in various parts of the nation. By March 1941 the War Department had asked Congress for hundreds of millions of dollars for new plants and had surveyed the nation for good locations. Because it could provide hundreds of thousands of gallons of water and requisite hydroelectric power, had relatively level ground, and offered a sizeable work force, the Grand River Dam area of northeastern Oklahoma came under scrutiny as a possible site. Other towns and states, particularly Terre Haute, Indiana, mounted strong competition for the installation, and in spring 1941 a delegation from the Pryor area, in Mayes County, went to Washington, D.C., to lobby. By July the War Department had decided to place a smokeless powder plant between Chouteau and Pryor, in Mayes County. As government officials assessed land in order to acquire approximately fifteen thousand acres for the facility, in late August the Oklahoma State Employment Service opened its job rolls to begin recruiting workers for the plant. Officials of E. I. du Pont de Nemours, Incorporated, arrived in September and began the design process. By that time 60 percent of the land had been acquired. Originally estimated at about $32 million, by September construction costs had been raised to $80 million, and an economic boom was striking Pryor and Chouteau. In that month a half-million-dollar Public Works Administration water and sewer improvement project was approved for Chouteau in order to accommodate the anticipated five to ten thousand workers who would live there, and the city approved two new residential additions. Chouteau, Pryor, and Locust Grove soon came to be known as "the Golden Triangle." By March 1942 the Oklahoma Ordnance Works (OOW) reservation extended south to Chouteau's city limits, and Pryor, the location of three OOW offices, lay about two miles from the plant. The facility was forty-six miles east of Tulsa. After the United States formally entered the war in December 1941 and began military operations in 1942, war materials production quickly became a serious national priority. The War Production Board, instituted in January 1942, began to expand munitions factories and powder plants. In March 1942, $5 million was budgeted to add a TNT plant to the Oklahoma Ordnance Works complex. Therefore, even more workers would be needed. In spring 1942 Pryor added a 500-home project built by the federal Public Housing Authority and a 335-home project funded by the Home Owners Loan Corporation. The OOW plant was constructed in the spring and summer, ultimately costing more than $84 million. The plant began operating in June 1942, and in September the first powder came off the production line. Over its brief history the plant's nearly ten thousand employees produced smokeless powder, nitric acid, sulphuric acid, and tetryl, all used for explosives and detonators. The 16,273-acre complex plant included 487 buildings (three complete chemical manufacturing buildings), two dozen residences, approximately fifty miles of railroad spur belonging to the Missouri, Kansas and Texas Railway, and four complete water systems. The facility produced more than four hundred million pounds of smokeless powder for small arms ammunition and artillery shells and more than ninety million pounds of TNT and tetryl for bombs and depth charges. On V-J Day (Victory in Japan), August 16, 1945, the plant produced its final batches of explosive material. With the war ended, the operations ceased. OOW and six other ordnance plants were declared surplus by the War Assets Administration in May 1946 and offered for sale. There were no buyers, but ideas for the property included converting part of it into a fertilizer plant or placing an air engineering development center or a hydrogen bomb plant there. Over the years many chemical-contaminated buildings were razed and some of the machinery sold. Then, as the Cold War escalated during the late 1940s, the government decided to keep the complex, selling the electric and water plants to the State of Oklahoma but spending approximately $200,000 per year to maintain the rest in case of war. In 1955–56 the U.S. Department of Defense reopened part of the plant in order to manufacture nitroguanadine, one ingredient in explosive powder, and new buildings were constructed. However, by late 1958 the General Services Administration once more offered the complex for lease. Soon, however, the Pryor Chamber of Commerce, Gene Redden, manager of the OOW from 1947 to 1959, and others convinced the State of Oklahoma to buy the property. 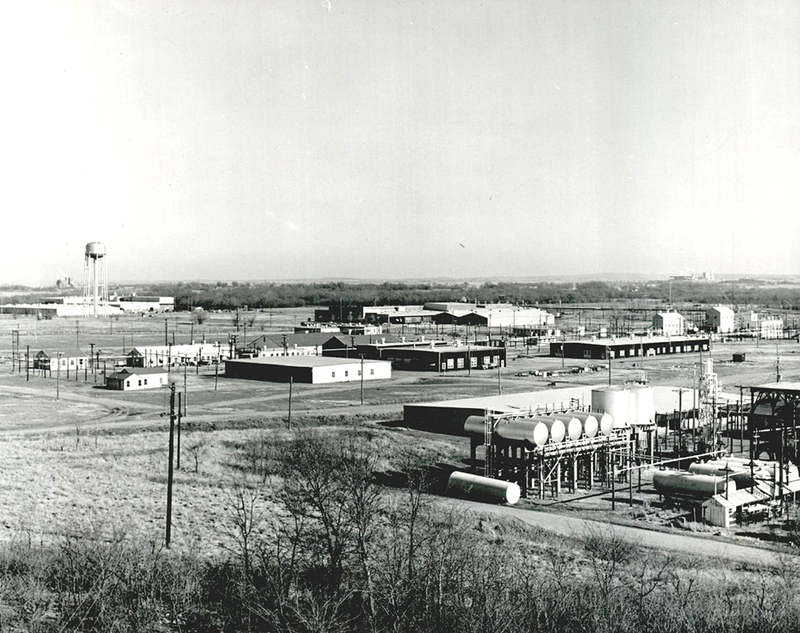 In December 1960 the legislature created the Oklahoma Ordnance Works Authority (OOWA) as a public trust to hold the former plant and promote its development. With political assistance from Sen. Robert S. Kerr, the State purchased more than ten thousand acres of the property from the federal government in October 1961 for $1.7 million. Accessed by U.S. Highways 69, 69A, 412, and 412B, and offering a five-thousand-foot airstrip, the site has since served as an ideal location for industrial development. Mid-America Industrial District, or Park, as it became known, by 2002 comprised more than seventy companies representing the manufacturing, construction, chemical, computer, and aviation industries, among numerous others. OOWA retains its administrative functions. "$51,000,000 Powder Plant Given Oklahoma as Chouteau-Pryor Site Okayed by FDR," Tulsa (Oklahoma) World, 2 August 1941. Joe Howell, "Oklahoma's Experience with Peacetime Conversions," Tulsa (Oklahoma) World, 13 April 1993. "Oklahoma Ordnance Works," Vertical File, Research Division, Oklahoma Historical Society, Oklahoma City. "Pryor," Vertical File, Downtown Branch, Tulsa City-County Library System, Tulsa, Oklahoma. Utilization of Government-Owned Plants and Facilities (Washington, D.C.: GPO, 1959). Dianna Everett, "Oklahoma Ordnance Works," The Encyclopedia of Oklahoma History and Culture, https://www.okhistory.org/publications/enc/entry.php?entry=OK069.